Large-scale physical mapping of the porcine genome has been limited because up to now no suitable genomic libraries for this purpose have been available. Therefore, we have constructed a yeast artificial chromosome (YAC) library from porcine lymphocytes. The library was cloned in the amplifiable vector pCGS966. A total of 10080 YAC clones was obtained and has been ordered into 105 96-well microtiter plates. 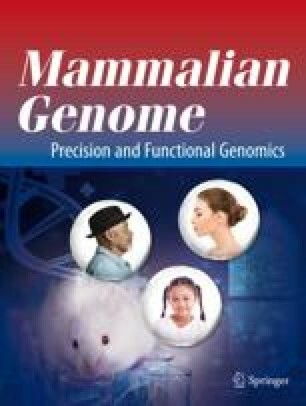 An average insert size of 300 kb was calculated from the analysis of 78 randomly selected clones, giving a onefold coverage of the porcine genome. To analyze the complexity, we have screened the library for five different genes and isolated four different clones containing parts of three of these genes. One YAC clone harboring parts of the porcine cardiac muscle ryanodine receptor (RYR2) gene allowed us to assign this locus to Chromosome (Chr) 14q22-q23. The data were confirmed by PCR analysis of a rodent-porcine hybrid cell panel.